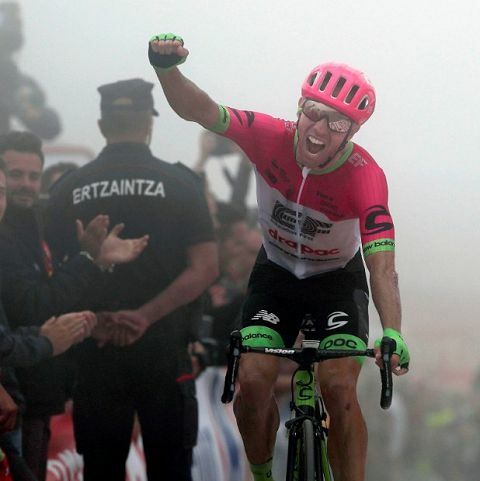 As the final meters ticked by on Wednesday’s Vuelta a España stage, Mike Woods of EF Education First – Drapac p/b Cannondale had a voice in his ear, urging him to ride. “Do it for your family,” the voice shouted. And Woods did. As the final meters ticked by on Wednesday’s Vuelta a España stage, Mike Woods had a voice in his ear, urging him to ride. “Do it for your family,” the voice shouted. And Woods did. Over those closing seconds, he took what was remained of his strength and left it on the road. He celebrated in the fog, raising a singe hand across the line. Too tired, too steep, to truly celebrate. And then Woods began to cry. “To win is great,” said EF Pro Cycling CEO Jonathan Vaughters. “To overcome the sadness he and his wife have been through this year is what truly makes me grateful and humble to have someone like Mike amongst us.” The emotional victory marks a milestone for Woods, who finished second at Liège-Bastgone-Liège this year and also a close second at a stage of the Giro d’Italia. There was a feeling of not “if,” but “when” with Woods. The Canadian seized his opportunity on the 17th stage of the Vuelta, riding himself into the breakaway with teammate Simon Clarke. Clarke, already a stage winner at the 2018 Vuelta a España, dedicated himself to Woods’ chances. He was the first to attack on the lower slopes of the final climb. Woods had the last word, launching the final attack 480 excruciatingly steep meters from the finish line. He won atop Balcón de Bizkaia, holding off a fast closing Dylan Teuns (BMC) by five seconds. While Woods clearly had the legs, the team needed every ounce of tactical acumen it could muster to deal with a large break and dwindling chances to win a stage for every team. Clarke was an ever-present figure near the front of the escape, particularly as the peloton began to chase in earnest. The Australian marked the first of the attacks from the leading group. And the second. And the third. His efforts saw the breakaway reach the base of Balcón de Bizkaia intact with a 3’47 head-start on the bunch. Clarke’s work wasn’t done when the breakaway began the final climb. With seven kilometers left to race, Clarke went on the offensive, launching an attack. When Clarke’s move was neutralized, Alessandro De Marchi (BMC) countered. The early attacks softened the legs in the breakaway. The upper slopes proved most decisive. De la Cruz set a tempo that saw all but Woods, Majka and Teuns fall away in the final three kilometers. Woods marked an attack by Teuns and another by De la Cruz before launching his own. “The climb is only as hard as your form is bad, and this year I felt good,” added Woods. “I love this area. Basque Country is special to me. I felt so good, and in those last few hundred meters, I could hear all the fans screaming my name.